That’s it the fringe is finished and I, just like many others, am enjoying the post-festival comedown, the adrenaline drop, the slight sadness yet relief I’m out of that frenzy and budget abyss. Unfortunately, I have come out the other side with no recordings to share with you… It’s not that I didn’t try, it’s that everyone is so busy promoting and performing their show then running around from show to show to party to party. Result no one has time to sit down to record a few tunes. It was crazier than expected and was so in different ways than I expected – I’ll know better next time! Anyways, Doppler still hasn’t arrived. Our separation has been disastrous to my moral. There was a confusion in the courier service and should have arrive two weeks ago! Hopefully, it’ll arrive tomorrow between 9am and 5pm. If all goes well tomorrow, I shall empty the Deck Theatre Company fringe apartment and sit outside till Doppler arrives. Put it back together and set of into the beautiful Scottish hills heading for Newcastle. If it doesn’t go well, then I’m stuck. I have another 2 weeks of travelling then it’ll be back to Oxford! Maybe I’ll see you on the road and maybe you can share the project. I’ll update you tomorrow when Doppler arrives! 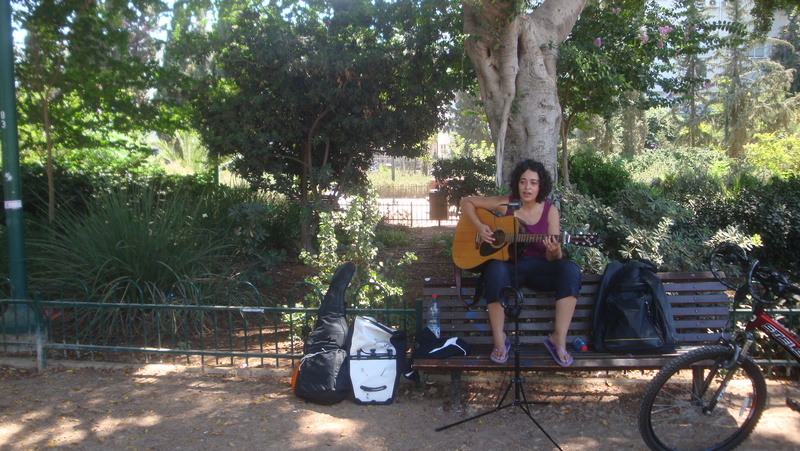 I was lying on the beach one afternoon in Tel Aviv playing guitar and flute when someone came up to me inviting me to join her group of friends. They were sitting down taking in late afternoon sun, eating fruit and chatting. I joined the conversation and very quickly I was given the contact for a place to stay in Jerusalem. A few days later, with the first two artists recorded, I decided it was time to visit somewhere new. I got in contact with this mysterious person. Quickly, I got a text back saying I was welcome to stay at this persons place in Jerusalem. I hoped on the bus and arrived in the Holy City an hour later. Jerusalem was just a tourist stop for me – I didn’t record anyone. However, I met some wonderful people. My host and her housemate were very nice to talk to and live in a very nice apartment. In the evening of my second day and last day, I went to see the dressed rehearsals of a small theatre/performance/design school my host was attending. I was pleasantly surprised by utterly beautiful performances with very cleverly designed puppets and sets. As soon as the rehearsals finished I caught a bus back to Tel Aviv. On the same day, I cycled on Tel Aviv’s green city bikes to what seemed like the out skirts of the city. 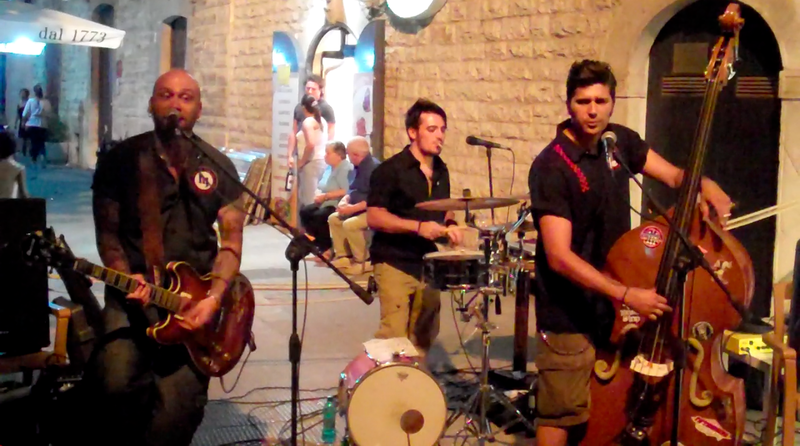 There I met with Rami Feinstein and his band. We went to his bass player’s apartment which essentially is a studio with a bedroom annexed to it. Unfortunately, they didn’t have that much time to record so we weren’t able to use their equipment (although I did borrow a microphone). The recording session was quick and efficient but difficult to capture properly with the equipment I had with me as the musicians were all amplified. Thus, I apologies, the vocals nearly disappear in the loud bits. With four artists recorded I caught the plane for Edinburgh. Well first I had to go through security… And lost two flutes in the process… Anyways, after four months of absence and many adventures, I’m back in the UK! I’ll be staying in Edinburgh up until the end of the Fringe – 27th August. I’m here run the sound and light on a small production for which I did the sound design. I’m working with a very talented team on an absurd dark comedy called Pinch in Love written by Caroline Mitchell and directed by the crazy and amazing Tania Higgins from The Deck Theatre Company. If you’re in Edinburgh or know anyone up here please invite them to show. If they say “Pinch will grow up to be a cyclist” they’ll get a free ticket! Voilà. That’s the end of Foreign countries for this trip. After Edinburgh I’ll be cycling back down to Oxford still recording on the way. I hope you to see you following the trip till the end. Thank you. On the 29th July, I took a plane from Athens to Tel Aviv, Israel. I landed safely but nostalgic of the cycling days. A good friend of mine with whom I studied met me at the airport. What followed was a week and a half of events racing by. I started by taking another plane down south to Eilat. There is held the Red Sea Jazz festival. I stayed three days enjoying not very exciting traditional and modern Jazz, every now and then, surprised by a truly mind boggling act. Then I took a bus across the desert to Be’er sheva were I met my Israel friend who drove us to a concert of Idan Raichel Project in some sort of resort in the middle of the desert! Fleeing the fans, we drove back to Tel Aviv in the night. I spent the next few days recording, drinking freshly pressed fruit juices and lying on the beach. I got very excited when after over 3 months of cycling I crossed more than 3 other traveling cyclist. Unfortunately, they where all going in the opposite direction. At some point, I briefly caught up with a cyclist from London who was heading for Istambul but, sadly, our routes quickly parted when I decided to cycle all round the bay of Kotor and he to cut across with a ferry. If you ever go cycling there, don’t believe what people say, it is a long cycle round but the view is stunning and worth every single extra Km. Finally, I got to Bar and booked a ticket to its Italian adriatic brother who grew an extra i: Bari. I left the next day and had a tumultuous ride across the sea and arrived early the next morning. That was it. After 5-6 years of absence, I was back in my mother’s home city and the cycle ride south was over! My aunt met me at the port to lead me to her house and for the next five days I was treated like a king! Such a huge contrast with the homeless cycling life I had been living most days since the beginning of the trip. That’s it for my brief episode in Italy. 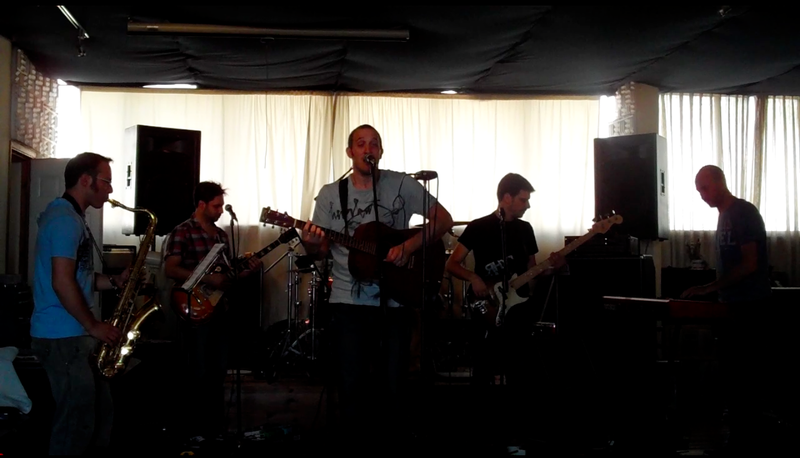 Next recordings from Israel will be up soon!